Continually conspiring to have a good time, Paul Frank packs each of their products with a passion for fun. Their sunglasses embody a lighthearted approach to life by fusing creativity and style together in order to create shades you won’t want to take off even after the sun goes down. 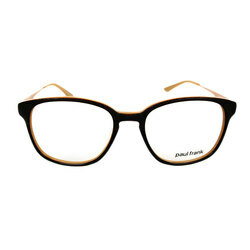 Inspired by happy colors, humor, and everyday joys, Paul Frank cranks out the sunglasses that keep the fun coming. To promote his band, Paul Frank started making wallets out of scrap vinyl in 1995. People loved the creative use of materials and original characters that adorned them. So, out of his garage in Huntington Beach, California, Paul launched a company that became an overnight success. Now, with dozens of product lines, Paul Frank amps up the fun and creativity with each new piece of merchandise as they incorporate a witty take on every day items in order to spice up your life. Even though Paul Frank emphasizes a quirky twist on everything, that doesn’t mean they don’t still pack a serious amount of style in as well. Their sunglasses for example, may have crazy names, but once you set your eyes on, or behind, these shades, you’ll understand why they demand to be taken seriously. Ladies, your slice of the action leaves nothing to be desired. Models like the Paul Frank My Daily Vacation come stocked with scratch resistant lenses, Distortion Free UVA and UVB protection, and a unique anti-aging coating. Oh yes, and they look straight up ridiculously good. Mix business with pleasure as you enjoy all the superb protection and style of the Far Away And Lost In Joy Sunglasses. Feel like a million bucks when you wear the Paul Frank Fist Full Of Dollars shades. It’s hard not to stand out when you put these things on, plus, you are getting all kinds of UV protection and picture perfect clarity. It doesn’t get much better in a man’s world than the Sacrifice To Sophistication Sunglasses. This classic look is all jacked up on a Paul Frank twist so you can demand respect and attention without saying a word. Inspired by the greats, the Legion Of Indecency never stops rocking a style infused with funk and attitude while providing 100% UVA/UVB defense. Paul Frank’s The Crafty Engineer provides nothing but tough durability and slick good looks that make them the total package when it comes to stylish, functional shades. Backed by a seemingly endless armory of musicians, artists, and athletes, Paul Frank relentlessly packs unprecedented portions of fun and originality into everything they roll out. While they may be a little offbeat and off the wall, they are definitely on track when it comes to products that celebrate a fresh, vibrant take on life.